Often, when we design a site, we want to be able to manage different kinds of paid site members, each with their own separate attributes. 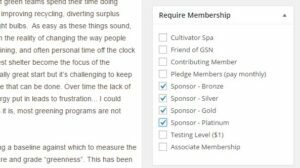 WordPress has its own set of member levels by default, but these aren’t very useful when you have your own special requirements for members. There are, however, plugins available to offer extended functionality for these, and one that we prefer is Paid Memberships Pro. Paid Memberships Pro is a plugin that allows WordPress site owners to define their own custom membership levels. These membership levels can be edited and assigned to users at any time by site administrators. The plugin is fully configured to work with eCommerce sites, and different types of memberships can set to be free or purchased with a one-time payment, or you can configure them to have membership fees charged monthly or yearly. Paid Memberships Pro can be configured to use any number of payment gateways, though the one we prefer is Authorize.NET, as users can complete transactions without leaving the site. 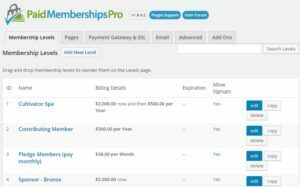 By default, Paid Memberships Pro can automatically generate several pages for membership management, meaning these don’t have to be custom coded. This includes member account pages, billing information, checkout, and invoice pages in addition to others. The plugin also automatically sends emails when users register or cancel membership, as well as sending reminders when new payments are due. Posts and pages on the site can be set to only be visible to certain membership levels, allowing you to create content only viewable by higher level members. In addition to its base functionality, Paid Membership Pro also had many add-ons that can further enhance what can be done with it. For example, the PMPro Email Templates add-on allows for customizing system emails sent by the plugin, allowing for custom-tailored content and branding. There are also several plugins for integrating with a variety of mailing list software, including MailChimp, Constant Contact, and Infusionsoft. In addition, Paid Memberships Pro can be integrated with WooCommerce with the PMPro WooCommerce Integration add-on, allowing users to purchase members like any other product on the site, as well as giving the ability to grant discounts on certain products based on membership level. 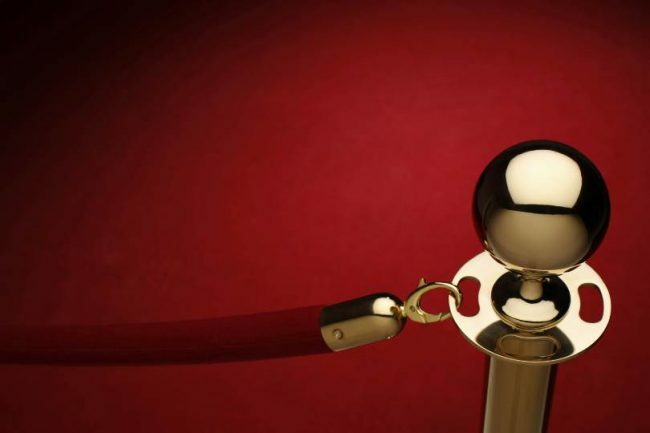 Paid Memberships Pro is a powerful tool for managing memberships on your WordPress site. It’s fully customizable, and comes with a wide range of add-ons to extend its functionality even further. At Watermelon Web Works, we have full access to Paid Memberships Pro and all of its add-ons, and we can help you to make the most of membership registration and management on your site.